PERSONALIZED "Just a Girl Boss Building Her Empire" Blank Writing Journal Book Gift to Write in, Pink, White & Gold Cover! Looking for an elegant gift to give to the woman entrepreneur who is building her empire and taking on the world? 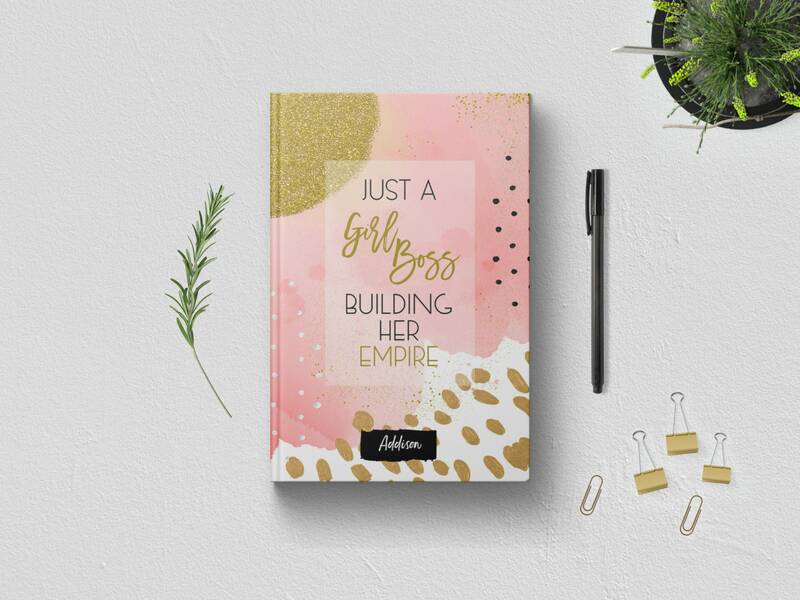 With its sophisticated and beautiful design, this Blank Journal Notebook with Lined Pages features the motivational and uplifting quote "Just a Girl Boss Building Her Empire" that is sure to provide inspiration for female entrepreneurs and business owners! Celebrate your business successes or toast the successes of your girlfriends or the women in your circle with this girl boss journal notebook. Makes the perfect gift idea for Bosses Day gifts, Realtor gifts, new jobs, new promotions, and congrats for new business. Give as a unique gift to daughters, sisters, friends, your boss, family, friends, girlfriends, co-workers, and neighbors...just about any motivated girl bosses! • Features the words "Just a Girl Boss Building Her Empire" on the gorgeously designed black, pink and white cover. Bucket List Journal. Planner. Writing Prompts. Guided Journal. Bucket List Gift. Bucket List Notebook. Goals. Adventure gifts. Mauve. Bucket List Journal. Planner. Writing Prompts. Guided Journal. Bucket List Gift. Bucket List Notebook. Goals. Adventure gifts. Gray Journal. Yes, this was a gift and she absolutely loves it! I would love to see it in person... Hoping to visit her soon. Thanks for checking in and appreciate your outstanding customer service! I ordered this journal as a gift for a friend who just opened her first office. Also appreciate the great customer service we received as they followed up to ensure the delivery had arrived. Arrived exactly as described. Dana does a fantastic job about communicating and responding to any questions you could have. Looking forward to doing business with her again soon.